BUFFALO, N.Y. -- Playing their first ever home game as a nationally ranked program, the University at Buffalo men's basketball team put on a show for the home fans as UB opened the game on a 15-0 run and never looked back, cruising to a 110-71 win over Dartmouth. Buffalo improves to 4-0 with the victory. The Bulls were playing without their leading scorer CJ Massinburg on Wednesday night, who was sitting out with a minor injury, but the other 10 players came to play, as all of them found the scoring column in the wire-to-wire victory. The 110 points scored tied the school record for points against a Division I opponent, while the 45 made field goals by UB are fifth all-time and the most since 46 against Brockport during the 1975-76 season. 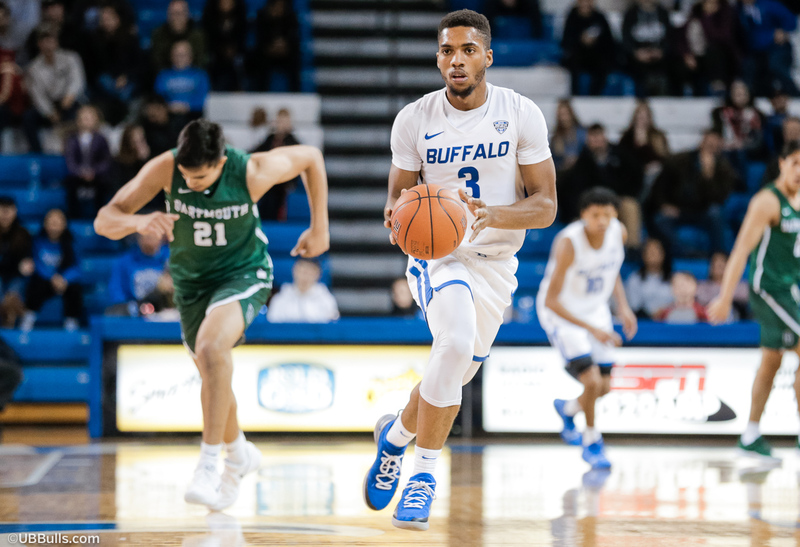 Following a nine-day layoff, there was no rust with this UB squad as the Bulls scored the first 15 points of the game, including five early points from senior Montell McRae. The Bulls continued to lead 21-6 when Dartmouth made their lone run of the night, pulling within three at 28-25 with 9:50 left. UB continued to lead by just five a 34-29 when a McRae three-pointers ignited a quick 8-1 run. A three-pointer from freshman Ronaldo Segu increased the advantage to 51-37 and the Bulls would wind up taking a 55-39 lead into the break following a late layup from junior Davonta Jordan. A quick 11-3 run to open the second half got the UB lead up to 66-42 following a dunk from senior Nick Perkins and with the Bulls leading 79-53, UB went on a 20-5 run, extending the lead to 99-58 with 5:55 left following a fast-break layup from freshman Jeenathan Williams. "With as hard and as fast as we play they might be able to hit a few threes to stay in it, but eventually they are going to crack with the speed we play at," said head coach Nate Oats. "We force teams to play fast and they were one of the slower teams in the country, but eventually you are going to have to run with us and with that tempo we are going to tire lots of teams out over the course of 40 minutes." The Bulls shot nearly 60% for the game as they hit 45-of-76 shots (59.2). UB also went 7-of-20 from behind the arc and 13-of-17 from the free throw line. Buffalo had 26 assists to just seven turnovers, recording just one turnover in the second half. Perkins had his first double-double of the season as he led the Bulls with 18 points and 10 rebounds. Perkins went 6-of-10 from the floor and a perfect 5-of-5 from the free throw line, while also blocking three shots. He moved into 12th place on UB's all-time scoring list as he now has 1,296 for his career. He was one of five players to score in double figures as Jordan and sophomore Jayvon Graves each finished with 16 points on the night. The 16 points for Graves tie his career high as he also tied his career best with six assists. Jordan had four assists to go along with his 16 points as he went 8-of-12 from the floor. Senior Jeremy Harris finished with 11 points and six rebounds, while Williams had the first double figure performance of his career with 11 points. Segu fell just short of double figures as he had nine points, to go along with six rebounds and four assists, while McRae and sophomore Trayvon Fagan each had eight points. Senior Dontay Caruthers had seven points and eight rebounds, while sophomore Brock Bertram added six points on 3-of-4 shooting. The Bulls dominated the specialty stats category, outscoring Dartmouth 25-3 in points off turnovers, 76-36 in point in the paint, and 31-9 on fast-break points. The 22nd ranked Bulls will remain home on Saturday afternoon when they welcome Marist to Alumni Arena at 2pm. It will be the final game for both teams before they head across the pond for the Belfast Hall of Fame Classic.